Nile Crocodile Tour of the world's oldest predator - Private Crocodile tours. The Nile Crocodile Farm, Prehistoric Predators. 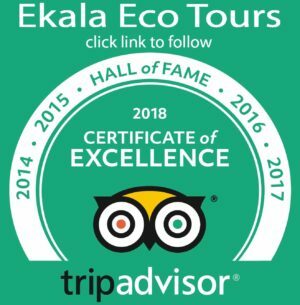 Ekala Eco Tours offer the Crocodile tour as a half day tour. Collection and drop off – O. R. Tambo airport or any other point – Johannesburg or Pretoria. We can also ad many other wildlife options or other local tours to create a full day tour. 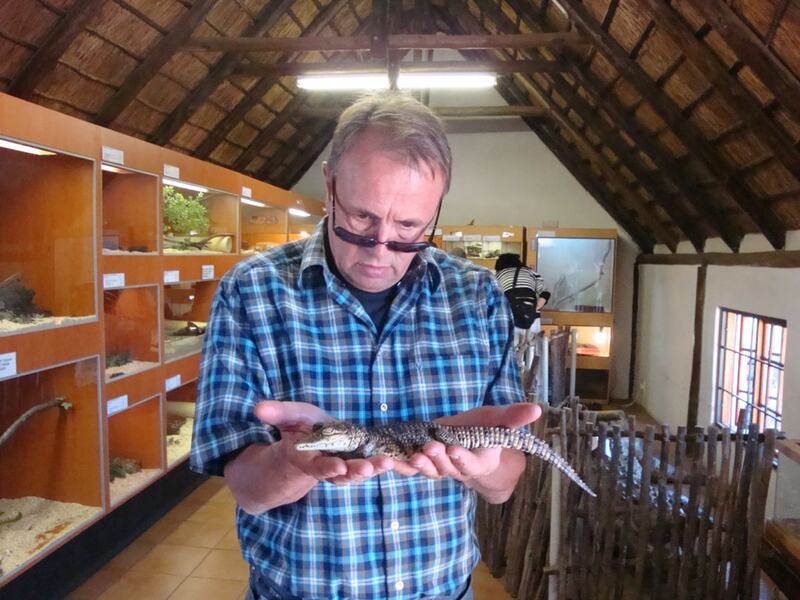 A commercial crocodile farm where informative guided tours provide an opportunity to observe one of the world’s oldest predators at a close range. The farm houses more than 800 crocodiles, ranging from the large adults to the hatchlings, which can be held. 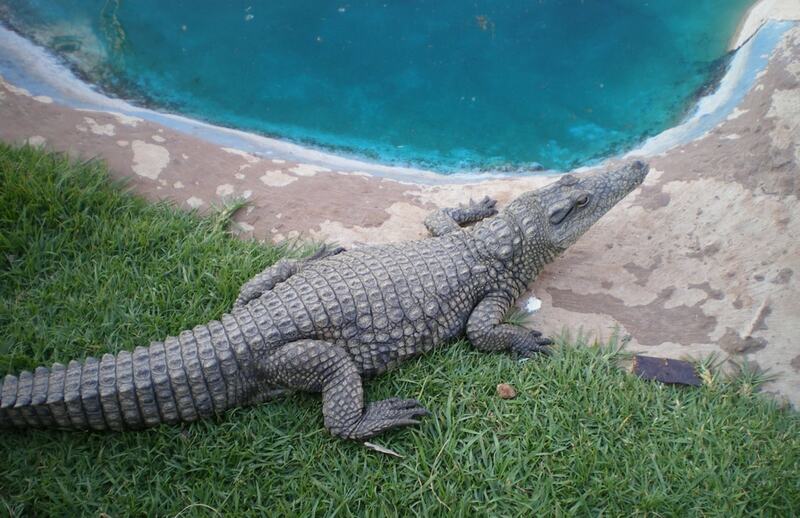 An educational program covers items of interest about the crocodiles and their environment. Feeding generally take place over the weekend at 14:00. A curio shop on site with wide variety of souvenirs. Crocodile tour is an experience that will be remembered for life. Conservation status: Lower risk of extinction. Primary threat to crocodiles is habitat loss, pollution, hunting and entanglements in fishing nets. Can reach speeds of 40 Km/h in water. Crocodiles are related to dinosaurs and are more closely related to birds than they are to snakes and lizards. The Nile crocodile is responsible for over 300 human deaths yearly in Africa. Mine Tours – gold and diamonds – surface and underground. Cullinan Diamond Mine Surface Motorised Tour – Shafts, Kimberlite dumps, slimes dam, big hole to new operations. Cullinan Diamond Mine Historical Tour – village to early operations including the black worker compound. Cullinan Diamond Mine Underground tour – only opportunity for an underground tour in a working mine – underground with the working shift. Gold Mine tours – Johannesburg gold history – over 130 years of Johannesburg as one of the biggest gold producers in the world. Ann van Dyk – De Wildt Cheetah Sanctuary – cheetah and wild dog experience. Elephant Sanctuary – an interaction tour that is compatible with wildlife conservation. Monkey Sanctuary – Experiencing primates in a natural environment – NO interactions with these primates. Ekala Eco Bird tours – South Africa – one of the most desirable birding areas in the World. Soweto Township Cultural tour – Ekala does not invade people’s privacy. Alexandra Township tour – part walking tour and part tour in an Alexandra Taxi. 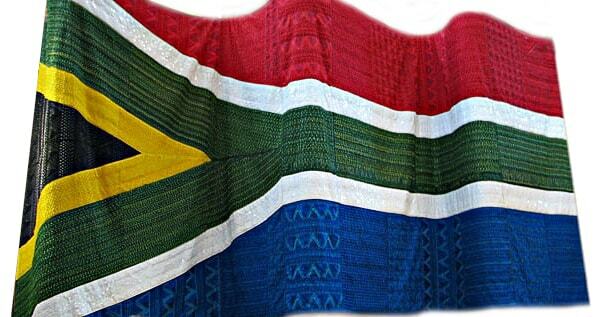 Lesedi cultural village – Living African Culture – Colourful Culture Zulu, Xhosa, Pedi, Sotho and Ndebele. Soweto Historical tour – early 1900’s establishment, through the Apartheid struggle with the major events that played an important part of our history – not only for Soweto but South Africa as a whole. Johannesburg Historical tour – from farm land to the world’s biggest gold producer to the backbone of South Africa. Freedom Route – South Africa’s Journey to Freedom tour including the life of Nelson Mandela and the struggle against Apartheid. Gandhi Tour – Mahatma Gandhi’s Johannesburg heritage tour. Liliesleaf historical site including Umkhonto we Sizwe and the Rivonia Trial. Nelson Mandela and others involved in the Rivonia trail and general opposition to Apartheid. Pretoria – Historical tour -Colonialism – Boer/British to democracy tour. Kruger Safari – private safaris with the greater Kruger National Game park. Constitution Hill including Constitutional Court – Old Fort to Prisons and the Constitutional Court Complex. Paleontology tour – Cradle of Humankind including both Maropeng and Sterkfontein Cave with current finds and activities. Panoramic route tour – en-route to or from the Kruger. Commercially run “parks” as the “lion type parks” we do not supply. Far better natural options that are more ecologically friendly and an experience that will be remembered for the right reason. These “parks” may be the cheapest options, but at what cost to the wildlife, specifically the lions. These commercially run “parks” and “Lion Parks” and related Predator breeding will in the long term affect South Africa’s brand attractiveness. Also no actual conservation value. Thus Ekala Eco Tours will not be involved in this in any way. Nothing beats seeing wildlife in its natural habitat – Kruger and Pilanesberg National Game Parks. Due to conservation issues that Ekala Eco Tours finds unacceptable – we do not support these types of commercially structured “Game Parks”. Commercial “parks” that breed lions (or simply have lions) for financial gain – must, in Ekala’s opinion, be avoided. Even if you are supplied the tour for free. Private “parks” are never the best options – specifically in an artificial environment – structured as a money-making facility only, with little regard for the wildlife and the long-term sustainability. The entire world is moving away from such facilities. Options that would leave you with a better experience – not a feeling that you would have negatively contributed to conservation in general and to the ultimate death of the lions encountered. Lion type safari “Parks” are the cheapest option available for any wildlife experience – however at what cost to the lions. Although a slight difference between the Lion and Safari Park and Rhino and Lion Reserve – in our opinion – both have conservational issues and should be avoided. Thus, currently we (Ekala Eco Tours) are not supplying tours to either. If a tour to one of the naturally wild locations is done with Ekala – we will highlight the industry of canned hunting and its attachment to these private parks. The differences between the various “parks” and “sanctuaries” i.e. : Pilanesberg and Kruger National Game Park, will be explained. Lions are listed as vulnerable to extinction with a deceasing wild population size. Breading in captivity does not rectify the problem. Not a single captive-bred, hand-reared lion (as would come from a private “park” type facility) has been successfully released into the wild. There is no conservation purpose to breed lions or to keep them in captivity. Handled lions can’t be introduced into the wild. Other than hunting, there is no sustainable market for lions. What you may experience is pleasing to the eye, it is however what goes on behind the scenes that is horrifying. Over 3 lions – PER DAY - are killed in South Africa for the trophy, bones, claws, and teeth market. All these lions come from private lion “parks”. Ekala refuses to be a part of this industry. Ekala is not against legal and ethical forms of sustainable hunting and recognises the role that hunting plays in many conservation programs. However, the current figure of profits from hunting, for Africa, of the actual value, trickling down to the local community is less than 3%. Ekala complies 100% with the international efforts to eradicate animal abuse. Any facility that breeds with lions or trades in any way with lions has no conservation value. Any facility using the excuse that their breeding programs are for conservation purposes - No conservation purpose to breed lions. Any facility breeding of lions in captivity - because when they get to full size there is no market for then other than hunters. Any facility breeding on demand, removing cubs from mothers prematurely, bottle fed, then “selling” cub interactions. Any facility – that has no interaction in any way – they essentially are still a lion breeding factory. Most of the above applies to captive cheetah facilities, specifically those that make no genuine efforts at reintroduction programs or promote the survival of free-ranging cheetahs. These reintroduction programs are possible for the cheetah where it is not possible for lion. Only one of the many (around 80 in South Africa) cheetah sanctuaries that Ekala is aware of, support breeding programs of the Anatolian shepherd dogs, use by farmers to mitigate the human/wildlife conflict. Enjoying and respecting South Africa’s national assets - wildlife, environment and the people.